The heavy cast iron Firebox Divider allows you to split the fire box area to create two distinct cooking zones for simultaneous direct and indirect cooking. Also, conserve the amount of natural lump charcoal used for smaller cooks. One per box. Comes in specific models for Oval XL 400 (#334), Oval LG 300 (#344) and Oval JR 200 (#314). Make authentic wood-fired pizza, bake bread, casseroles, and pies. 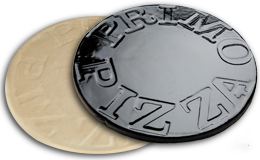 Available in glazed and unglazed models and in two sizes. 16″ Glazed for XL 400, LG 300, Kamado (#338), 16″ Unglazed for XL 400, LG 300, Kamado, G 420 (#348), 13″ Glazed for XL 400, LG 300, JR 200, Kamado, G 420 (#340), 13″ Unglazed for XL 400, LG 300, JR 200, Kamado, G 420 (#350). 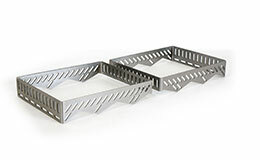 Use the Heat Deflector Racks with the Ceramic Heat Deflector Plates for indirect cooking and they may be used to hold a drip pan. One set per box. Comes in specific models for Oval XL 400 (#333), Oval LG 300 (#316) and Oval JR 200 (#313). Converts your grill into an oven, a roaster and a smoker. 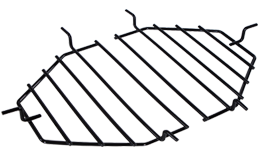 Use the ceramic Heat Deflector Plates in conjunction with the Heat Deflector Racks for each specific Oval grill model. One set per box. Comes in specific models for Oval XL 400 & G 420 (#324), Oval LG 300 (#326) and Oval JR 200 (#325). 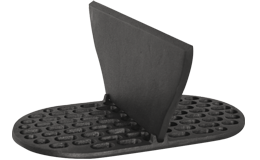 Holds the Heat Deflector Plates for indirect cooking and may be used to hold a drip pan in the Primo Oval G 420 Gas Grill. Part model #G400. 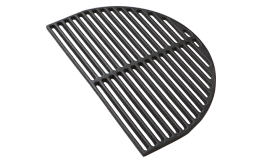 The half-moon Cast Iron Grate is perfect for searing meats and locking in the juices at high temperatures. 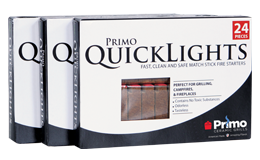 It offers higher heat retention, even heat distribution, and faster cooking times. One per box. Comes in specific models for XL 400 (#361), LG 300 (#364), JR 200 (#363). 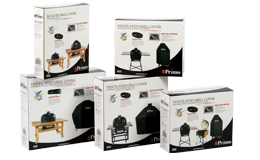 Protect your grill from the elements with one of our durable grill covers. Custom fitted with an embroidered Primo logo for every grill configuration whether it’s in a table, cart or cradle. 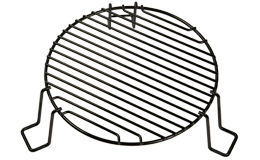 Comes in specific models for (click for compatibility chart): Jack Daniel’s Edition Oval XL 400 & Primo Oval XL 400 , Primo Oval LG 300 , Primo Oval JR 200 , Primo Kamado Round , Primo All-In-One Series , and Built-in Applications for all Primo Oval Grills . 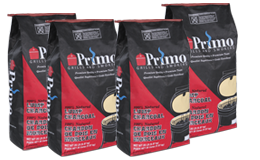 Cover Model #424 for Primo Oval G 420C (in cart). The “V” Rack is a porcelain-coated dual-purpose rack holds five racks of ribs. 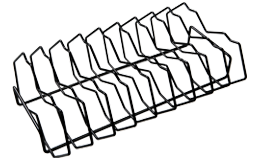 Invert the rack to hold large cuts of beef, pork or poultry. 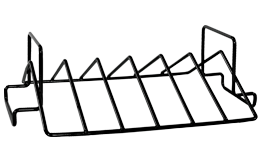 Invert the rack as shown here to hold multiple racks of ribs. Compatible with Oval XL 400, Oval LG 300, Kamado, G 420 (#335). 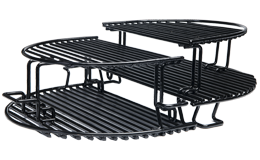 Our Porcelain-coated Rib Racks are available in 5-Slot and 9-Slot models. Both racks can be stacked in an XL 400 to cook 14 racks of ribs simultaneously. One rack per box. 5-Slot model compatible with XL 400, LG 300, JR 200, Kamado, G 420 (#342). 9-Slot compatible with XL 400 & G 420 (#341). 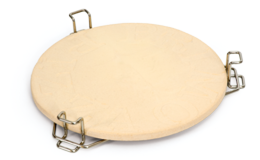 The porcelain-coated steel Multi-Purpose Round Rack is designed to be used both as an extended cooking rack, or it can be inverted for use as a drip pan pack. 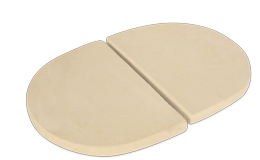 When inverted a 13″ Baking/Pizza Stone (#350) can be added for baking, roasting, or smoking. One per box (# 330).